Enhance the flavor of any burger with a fresh, homemade hamburger bun. It's worth the extra effort. This page contains homemade hamburger bun recipes. I was looking through my messages and realized I hadn't answered a request for the hamburger buns I make. Sorry! But I will share here since I read the suggestions for hamburger patties. 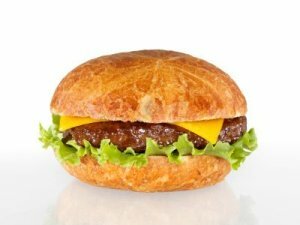 Why go to the bother of making hamburger buns? One, they are delicious, two you can make them larger than store bought, and three, they are more filling when trimmed with all the extras; really a great meal. Use any white bread or whole wheat recipe you like, that contains milk. Milk makes bread more tender, tasty, and nutritious. One recipe will make 8 buns. Knead dough the first time as per instructions, let rise, knead second time and cut into 8 equal pieces,and then roll each piece into a ball. Using hands or a rolling pin, flatten to about 4 inches across or close to that. Push down a bit in the center out towards the edges, so it looks like a round candy with a dip in the center. That's because as it rises it will end up fairly level, not with a big mound in the middle. Sprinkle cornmeal or cream of wheat cereal on a pan or baking stone and set flattened rounds a few inches apart on the meal, cover with plastic or wax paper and let rise. Bake in preheated (350 degree F) oven when they are about doubled in puffiness for about 12 minutes. Could be a minute or two more, depending on how you like them. Should be very lightly browned. Remove pan and cool before taking off with spatula. Slice carefully across with knife. They should hold together if you are slow. They can be grilled or popped in toaster for just a minute to heat when assembling buns. My family loves them. Dissolve yeast in warm milk, not hot. Let rise to double, punch down. Then knead 10 times, cover and let rest just five minutes. Roll out dough one inch thick. Cut out buns with large cookie cutter or top of drinking class. Let rise 45 to 60 minutes. Bake at 400 degrees F for just 10 minutes. This also makes melt in your mouth dinner rolls. Dissolve yeast in warm water. Add salt, sugar, beaten egg and melted butter with a wire whisk, a little at a time. Then knead on floured surface, adding only enough flour to keep dough from sticking. A soft dough makes lighter buns. Cover and let rise in greased bowl 1 hour or until doubled. Divide into 12 pieces and form into smooth balls, greasing hands if necessary. Place on greased sheet and flatten with your hand. Cover and let rise 30-40 minutes. Bake at 375 degrees F. for 10-12 minutes or until golden. Dissolve yeast in water. Beat eggs lightly and add. Mix in the rest of the ingredients. Cover and let rise 1 hour. Shape into rolls or buns, place on greased baking sheet. Let rise 1 hour and bake in hot oven, 375 degrees F, for 15-25 minutes. Grease tops with margarine.